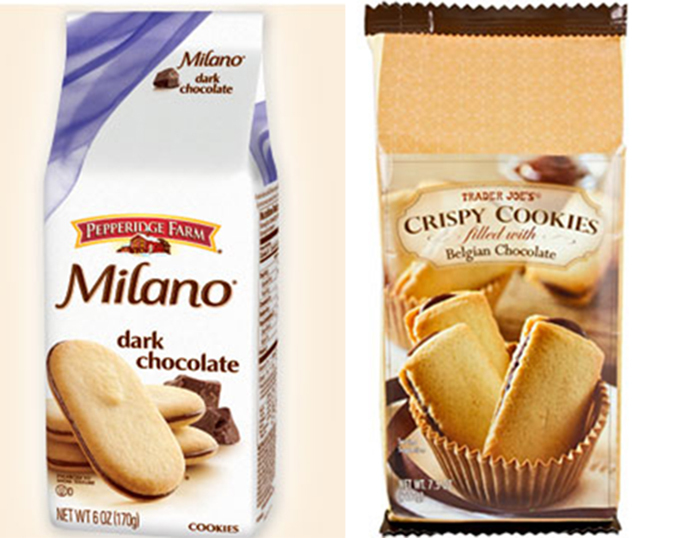 Pepperidge Farm is calling out Trader Joe’s for allegedly being some kind of cookie monster, claiming in a new lawsuit that the grocery company is infringing on its trademark for selling a cookie that it says is a ripoff of its Milano cookie. For those who aren’t familiar, Milano cookies feature two cookies with chocolate filling (or sometimes other flavors) sandwiched in between. The company registered a trademark for the cookie — which first appeared on tables in 1956 — in 2010. By selling a product called Crispy Cookies, Trader Joe’s is damaging Pepperidge Farm’s goodwill and confusing shoppers, according to the lawsuit reported by Reuters. Though Trader Joe’s cookie is more rectangular, it has rounded edges, “mimicking an overall oval shape,” the lawsuit says. The grocery chain also uses similar packaging, the complaint claims. “The acts of Trader Joe’s have been malicious and calculated to injure Pepperidge Farm,” citing the hundreds of millions of dollars in revenue the company has earned with the cookie in the last decade. A Trader Joe’s spokeswoman told Reuters the company does not discuss pending litigation. Pepperidge Farm is seeking to stop sales of the rival cookie, as well as compensatory and punitive damages. “The trust Pepperidge Farm has built with consumers is of utmost importance to us,” a spokeswoman told Reuters.